Harnessing the world’s most powerful graphics processor, AMD today introduced the ATI Radeon HD 5870 Eyefinity 6 Edition graphics card. Equipped with 2GB of GDDR5 memory, the ATI Radeon HD 5870 Eyefinity 6 is the first graphics card capable of rendering in excess of 1 billion pixels per second in today’s titles, unleashing PC game environments of unprecedented size and resolution. Enthusiast gamers now have access to a seamless, stunning perspective across six displays, enabling up to 12 times more resolution than 1080p HD. Before today, PC enthusiasts needed two or even three graphics cards to simultaneously drive six independent computer monitors at and beyond 1080p HD resolutions. The ATI Radeon HD 5870 Eyefinity 6 Edition delivers that capability in one graphics card, reducing the cost of ownership for a six-screen display while streamlining the ease with which gamers and productivity experts can set up hundreds of possible multi-monitor configurations. Users can also benefit from a well-developed ecosystem around ATI Eyefinity technology, including broad support by the game development community. Updates in the latest ATI Catalyst graphics driver software continue to improve the ATI Eyefinity experience by periodically enabling new features, while a partner program exists to help assist users in identifying ATI Eyefinity-validated components to use in their set-ups. 2GB of GDDR5 memory to enable high frame rates and image quality settings in the latest DirectX 11 games in three- and six-display gaming setups. Full display flexibility right out of the box, with the inclusion of five adaptors: two mini DisplayPort to DisplayPort adapters, two passive mini DisplayPort to DVI dongles, and one passive mini DisplayPort to HDMI dongle. Support for 3x2 display configuration with new configurations supported in upcoming ATI Catalyst software updates. Broad support for software developers worldwide including Bioware, Codemasters, EA, and Turbine who have adopted ATI Eyefinity multi-display technology in the latest DirectX 11 games such as DiRT 2 from Codemasters and Battlefield Bad Company 2 from EA DICE. 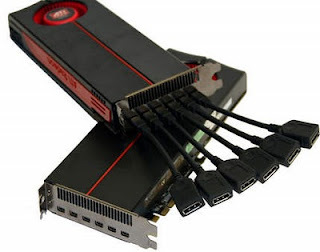 The ability to use ATI CrossFireX multi-GPU technology in conjunction with ATI Eyefinity multi-display capabilities as released in ATI Catalyst graphics drivers version 10.2, enabling increased gaming performance when driving high-resolution ATI Eyefinity display groups. ATI Eyefinity technology enhancements were made available in ATI Catalyst graphics update version 10.3, including bezel compensation, which helps simulate a more integrated display surface by adjusting for display bezels. Pc Perspective - AMD Radeon HD 5870 Eyefinity 6 Edition Review: 6 monitor gaming! Maximum PC - Eyefinity Performance Preview: The First Benchmarks!